Earlier in the month, we shared an exclusive look at the forthcoming Nike SB x Air Jordan 1 Retro High OG. The drop follows 2014’s Lance Mountain iterations with wear-away uppers that revealed another colorway after constant wear and tear. Today, additional images have surfaced of the colors hidden beneath the “Court Purple” with “University Gold” (“Lakers”) edition. 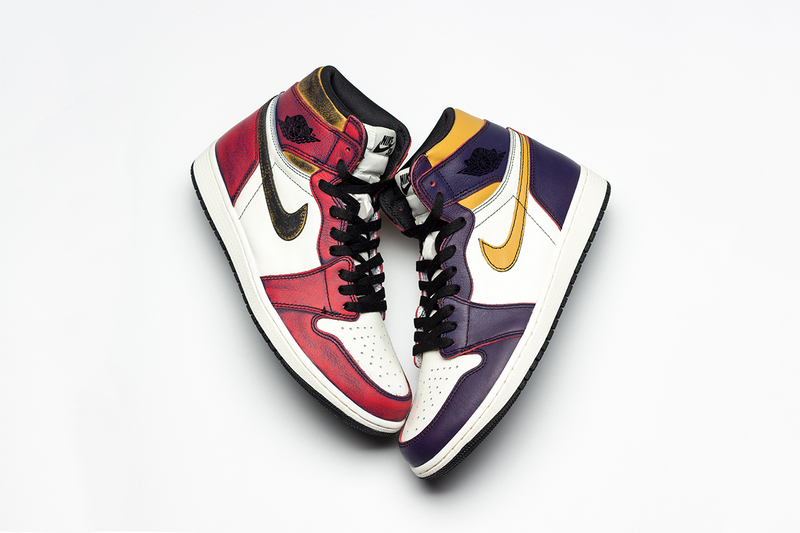 OG Jordan Brand-enthusiasts can rejoice as the modern mix of purple and gold eventually fades into the Air Jordan 1’s “Chicago” color scheme – the favored mix of red, white and black. The Air Jordan 1 – arguably the best-looking sneaker after significant break-in time – serves as the perfect silhouette for the skate-inspired theme. Take a look at what one of the Nike SB x Air Jordan 1 Retro High OG will reveal after constant wear and let us know which pair you favor out of the duo. Expect this release to take place on May 25 at select Jordan Brand stockists and Nike SNKRS for $175 USD. In related AJ1 news, you can take a closer look at its upcoming Travis Scott collaboration.